I can’t help it, but my shelves seemed littered (pardon the pun) with delightful doggie-inspired titles lately. 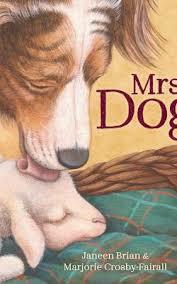 Just what makes animal tales, namely those featuring cute and courageous canines so attractive for young readers? Is it that dogs and cats are real, free of pretension and judgement and brimming with pure joie de vivre? Is it because their will to live for the here and now surpasses all others, just like a young child’s? Whatever the magnetic force behind the love of dog stories, this small pack merely reinforces the bond. Lisa Shanahan brought us the irrepressible Bear and Chook and has a knack of capturing the thrill of story within singsong narrative. 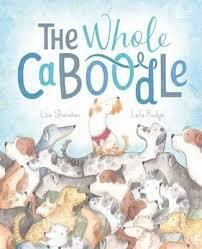 The Whole Caboodle is no exception and offers ‘oodles’ of imaginative linguistic word play with the added bonus of walking 3 – 5 year-olds through some fun counting rhymes. It’s more of a stroll-through-the-park-spot-the-hidden-dog-breed than a full-blown doggie tale, but Rudge’s expressive illustrations will keep you tugging at the leash for more. Great for kids who are into dogs and all their varied shapes and sizes. 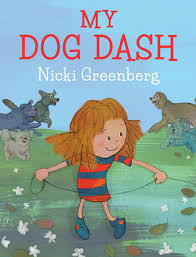 The memories of my not-so-distant puppy schooling experience with our border collie leapt back to prominence as I read Greenberg’s cute account of one little girl’s adventures with her new pet. If you were to read the text aloud without the pictures, you’d swear her pet, the fiend of puppy school, is the worst dog you’d ever laid eyes on. Look again though and you’ll see that not all dogs are created equal. After one agonising night of anguish, this pet turns out to be the best companion ever. Greenberg rarely disappoints. Her jolly illustrations, beguiling contradicting narrative, lovable characters, and utterly adorable ending are assured winners. Go Dash, Go! Brian’s exquisite use of language is the beating heart of this gorgeous picture book and conveys a story that will bring a tear to your eye and a smile to your heart. Crosby-Fairall’s illustrations are equally divine. The alternating use of perspective shifts the reader seamlessly from merely being an observer to Mrs Dog’s, the Tall-Ones’ and of course adorable little Baa-rah’s point-of-view. A simple tale of devotion, love and loyalty possessing all the best bits of Babe but stunning and memorable in its own right. Highly recommended and not just because Mrs Dog is a beautiful Collie. This is an enjoyable little mix up of a book attractively presented as a hard soft cover just right for post preschool hands to master. Combining imagination with fantasy, Regal Beagle tells the tale of Lucy, the deceased Queen’s best friend and only living beneficiary to the throne. Lucy is brave and clever, caring and loyal but is in danger of losing her crown to the diabolical Lord Runcible who craves the title of ruler of the kingdom as his own. His obsession to rid the kingdom of Queen Lucy causes an infestation of plague proportions and provides plenty of witty hustle to this easy to read story. Khurana’s writing style is chatty and carefree and is ably supported by Greiner’s jazzy graphic illustrations. A fun, flowing read perfect for kids who understand that anything is possible. This blue ribbon read strikes with pinpoint accuracy at dog-loving 7 – 12 year-olds. Hefty subject matter is served up as a heart-warming tale about a girl who dies tragically and returns to life as a dog following a Pearly Gates blunder. As pedestrian as that sounds, this sweet little story lopes along at a satisfying pace that will keep children page turning until the very end. Daisy aka Ray’s spiritual, emotional and canine journey is just as likely to make you grin as it is to move you to sadness, however one thing is for sure, it will captivate young readers enough to make them want to wag their tails (if they had them). 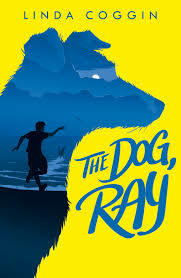 Funny, spirited and stirring, The Dog, Ray embodies much more than just Daisy’s afterlife as a dog. Homelessness, friendship, animal cruelty, tragedy, and family relationships are incorporated throughout this story, which is big on heart and suffused with hope. It does have a happy ever after ending, however perhaps not the one you were hoping for. Concise, captivating and creative.